A M E R IC A N BU F FA LO L E AT H E R F U R NI T U R E Experience the ultimate in luxury, comfort & design with furniture from the Buffalo Collection. Our furniture is hand-made in America using the finest materials & methods of old world craftsmanship. Let us enrich your client’s lifestyle by creating timeless custom furnishings of the highest quality. ADVERTISING SALES RICK EMRICH, Marketing Rep. for ASID Arizona North Chapter 602.540.9281 Desert Design Magazine is published quarterly by the Arizona North Chapter of the American Society of Interior Designers (ASID). 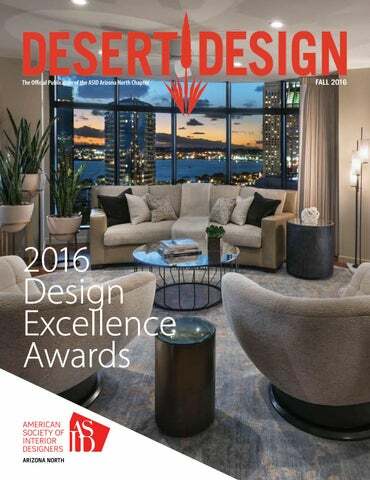 Editorial content and the Desert Design Magazine title are controlled and owned by the Arizona North Chapter of ASID. Reproduction of this publication in whole or in part, in any form, is strictly prohibited without the written permission of the Arizona North Chapter of ASID. 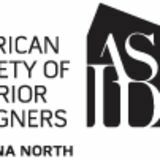 The Arizona North Chapter of ASID assumes no responsibility for the validity of advertisers’ claims or statements made in published items. Don’t Miss T his Date! Bringing your next tile project to life with our free design software! Showrooms are open to the trade and public 7 days a week. Over 4,000 quality tiles and coordinating trim pieces to choose from. Up to 50 inspiring room displays in every showroom. walk to the gorgeous, wooden front door which opened into a double heighted Foyer leading into the Great Room. On the way to the Great Room, featuring an enchanting fireplace, guests were delighted by the covered patio. Beyond the patio there was a pool and a spa that seemed to flow right to the mountains. THE ULTIMATE IN WELL-BEING The Neorest intelligent toilet features an auto open/ close lid, heated seat, and a cleansing spray for your comfort and health. TEXTURED. VERSATILE. VIBR ANT. Art meets craft. ©2016 Dunn-Edwards Corporation. All rights reserved. Contact the ASID offices to be a 2017 Design for Hire Interior Designer: www.ASIDAZNorth.org 602 569 8916 Submit Your Accolades! of Think Art Gallery, who brought the natural ease and wit of a long-married couple to the stage as they adeptly wove through the program and presented awards in 33 categories. The evening’s highlight was the announcement of our most prestigious Design Excellence Awards. Best of Show Residential was awarded to Lynne Beyer, Allied ASID, and Best of Show Commercial was awarded to Lawrence Lake, ASID. Congratulations to these two deserving designers and to all the winners who entered amazing projects. A very special thank you goes to the Design Excellence Awards Committee, our fabulous volunteers, the Board, our Industry Partners who generously contributed to gift bags for attendees, and to our Zura Collection talented photographer for the evening, Mark Boisclair. Many, many thanks go to our generous sponsors, Alyshaan Fine Rugs and Cities West Publishing, without whom we could not have had such a wonderful event. Helping clients share your vision is a breeze when they can touch, see and compare top-selling bath, kitchen and lighting products in our state-of-the-art showrooms. With our consultants’ product knowledge, planning and presentation resources, as well as coordination with you and your contractors, Ferguson provides an extension of your business to help bring your design to life. Find everything you need to create a stunning and functional space that your clients will love. Shop fashion-forward collections, cutting-edge looks, and exclusive styles from all the top names in flooring. Complete your project with the most spectacular array of high-fashion window dressings in the market. The Phoenix Home & Garden Top Design Sources App offers a wealth of information about featured companies including their specialties and expertise, new products, photos of completed projects, videos, design professionals and more. Plus, we’ll be updating the information throughout the year, so when you search for a builder or contractor, a drapery workroom or an antique shop, you’ll find lots of current, relevant and ultimately spot-on shopping and design insights. ÂŠ2016 Monark Premium Appliance Co. All rights reserved. Arizona North Chapter Industry Partner Directory Antique Drapery Rod Co., Inc.
Arizona North Chapter Industry Partner Directory Cullum Homes, Inc. Custom Workshop for Designers, Inc.
Arizona North Chapter Industry Partner Directory Hansgrohe, Inc.
Arizona North Chapter Industry Partner Directory Kravet, Inc. The Arizona North Chapter of the American Society of Interior Designers Fall quarterly magazine.